On a Saturday morning in April, a group of six College of Law students, led by Professor Robin Paul Malloy, E.I. White Chair and Distinguished Professor of Law, presented a morning of continuing education to zoning officials from five towns and the City of Syracuse. This year marked the fourth year in a row that Syracuse Law students engaged the local community in one of its continuing education workshops. 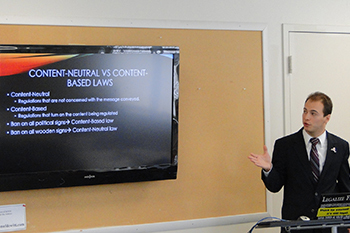 Third-year law student Zach Greenberg makes a presentation during the zoning law workshop for local officials. In New York State, all members of a planning board and/or a zoning board of appeal must receive four hours of continuing education each year. In partnership with the Town of DeWitt, Malloy organized a group of students to present a four hour zoning law workshop to meet the continuing education requirement. This year’s workshop covered important topics such as: understanding an Article 78 Review; dealing with sign regulations under the recent U.S. Supreme Court case of Reed; properly handling sidewalk issues under the Americans with Disabilities Act; regulating Air BnB in residential neighborhoods; and updating compliance with the Fair Housing Act under the Affirmatively Furthering Fair Housing Final Rule implemented under the Obama Administration. The program is funded through the College of Law and its Center for Property, Citizenship, and Social Entrepreneurism. Participating students included third-year students Dennis W. Polio, Zach Greenberg and Sarah Spencer; and second-year students Shannon Crane, Matthew Schachte and Colin Tansits.